The following pictures show the Wind Indicator I installed on the top my TI mast. I can honestly say now that it was worth the effort to make this device. It's been working great for several months and has helped me to become a better sailor. I've installed two more units on friends boats as well. The first one I made for myself took longer because......? it was the first one, the other two went much faster. A Mast Light could be attached with a longer Backing Plate. The Vane-Post is removable which is good when transporting, and the installation although it is quite strong, is not permanently fixed to the mast. I hope this information helps those who have been considering such an installation, or just encourages the creative thinking process that this forum thrives on. Feel free to contact me with any questions. A completed unit not yet installed on the mast. (The vise grips are just holding it up for the picture). I carefully drilled out the top and bottom holes on the Windex J-Base with a 1/4" bit. What I'm attempting to show here are the steps in making the PVC Backing Plate. I started with a piece of 1-1/4" (schedule 40) PVC pipe which I cut on a table saw into a strip measuring approx. 1,3/8" wide by 2,3/4" long. The bottom image shows a finished, sanded piece with two holes that were made by centering the Windex J-Base on top of the PVC Backing Plate, then marking and drilling two 1/4" holes. PVC sands quite easily, I used a soft sanding flap wheel on my electric grinder, but you could also do this by hand sanding until smooth. I've found that each mast has a different size opening in the Web Loop, and it's important to get a fairly snug fit here. The finished sanded piece on mine measured 1,3/16" wide. Image showing the inside and outside of an assembled unit. Note: The Windex 10 comes with a side mount opening tapped for 1/4 threads. I'm using a 1" x 1/4 ss Thumb Screw to hold the Vane-Post in place when I go sailing. The two 1/2" x 1/4" ss Hex Bolts go through the PVC Backing Plate into the J-Base have no washers. This is the tricky part, take your time. What I did before this picture was taken was I first fitted the PVC Backing Plate in between the Web Loop and centered it. (This is where it is important to have sanded the width of the plate to make a snug fit). I then placed the J-Base on top of and centered on the Web Loop, with the receiving hole for the Vane-Post facing up. With a small crayon pushing down through the bolt holes of the J-Base I marked the two corresponding holes on to the Web Loop and set the J-Base aside. I then clamped a small 8 penny nail with my vice grips and heated up the pointy end of it with a torch. By carefully and lightly touching the two places on the Web Loop with the end of the hot nail where I had marked the corresponding holes, I melted thru the web material and made two perfectly sealed holes just slightly smaller than 1/4" in dia. If you have centered everything carefully beforehand, these holes will line up with the two holes of your PVC Backing Plate. Next, there is just enough room in between the inside of the Web Loop and the PVC Backing Plate to push a 1/4" ss nut down to where it lines up with the bottom hole. I then placed the J-Base on top of the Web Loop and fitted a 1/2" x 1/4" bolt through the bottom hole of the J-Base and turned the bolt to catch just the first threads of the nut. I then inserted the top bolt and did the same thing. Sometimes I can tighten the bolts without pushing something inside to catch the nut, other times I have had to push a small tool inside to hold the nut from turning. Here is the Wind Indicator as it appears on the top of my mast. i think I might have done the same thing with five feet of ribbon, but you gave me a good idea for a camera mount. We've been trying to use the Hero GoPro with the roll cage mount. It doesn't do well clamping that over the webbing strap at the top. It makes the sail bind at that point, and doesn't let it freely move on the mast. 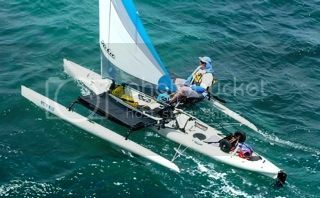 I think your idea might be really good for a camera mount that allows the sail to still move. Glad you like it, and that you see other possibilities. That's what this is all about. Me too. Thanks for the photos. That PCV setup looks like a great way to mount this vane way out on an Aka. You may actually be able to position it between 30-45 degrees from your forward point of view, so that the tail points directly at you where your boat typically achieves maximum upwind lift. Beyond this you know you are losing power. Does this make sense? I suppose a tell tale will do the same thing. I should noodle with that. I don't think this is doable with a rotating mast. The arrow is always going to point at the apparent wind, and has no connection to the direction of the boat. I put the same on my AI a few months ago but mounted the bracket permanently to the the mast. The quick release can be done with fingernails or a dime. I mounted the holding bracket facing aft when the sail is out and 1" below where the top of the sail locks into the mast. I center punched and far undersized the original mast holes so that is was absolutely vertical then coated the mounting screws and mounting base in clear silicone, then drove the screws home. Open ocean has not proven to be as effective as lakes. In open ocean the wind is usually very easy to see and read but lakes can get goofy and change directions quickly. While this item is not an "absolute necessity" it is GREAT to have! I found mine on eBay, no reserve.01 start. Few bid because many want larger. 10" or 15" <-tops is PERFECT for AI's and TI's. The reason why I used 1/4 ss bolts with a nut is so I could tighten the bracket thru the webbing and pvc backing plate. If I had used a bevelved head countersunk screws or bolt, I would'nt have been able to hold it unless perhaps I used a 90 degree screwdriver inserted into the webbing. That might be possible...? I just didn't think about doing it that way at the time. I've used the wind indicator now for a while and have had no problems. The nuts don't touch the inside of the webbing and I see no wear marks. This and keeping the sail trimmed so the Tell Tails are flying back are an enormous help in getting the most out of my sailing experience. Thanks Sunny. The main thing is there is no wear. You avoided this. It's amazing how fast anything that rubs or jiggles on the boat creates wear. Especially true of the sail and the light threads used there. Presently, I use 2 Hawaiian style "Lei Hulu" ribbons on the mast, along with extra tell tails along the luff. Nice thing about the lei is that it gives a visual indication of wind strength as well as direction. But I tend to get a crick in my neck checking it all the time. So for comfort and safety, I really like the idea of having the "main" wind indicator in-line with my line of sight (on the bow or Akas). It seems to me that having the lei or an indicator at 17ft may not reflect the actual surface wind conditions that most of the sail uses to pull the boat upwind. Any hardened sailors out there have an opinion on the ideal placement of our wind indicators? Last edited by NOHUHU on Sun Jan 29, 2012 10:16 pm, edited 1 time in total. I'll have a go (based on racing experience with my 24-25 foot keel yachts). The masthead location is probably a better indicator of the real wind the sail is using to generate lift. The closer to the sea surface, the more the interaction interferes with the power of the wind. On my yachts, I used to have strands of wool on the shrouds either side of the mast, tell tails 30% back from the mast upper, middle & lower on the sail, small matching ribbons on the leech, plus a masthead Windex indicator. If everything was flowing in harmony going to windward, the boat was "in the groove"
Given the limited capability to change the sail shape on an Island (combined with the designed flexibility of the unstayed mast), it is probably enough to have just one or two leech ribbons and tell tails within the body of the sail plus masthead indicator. 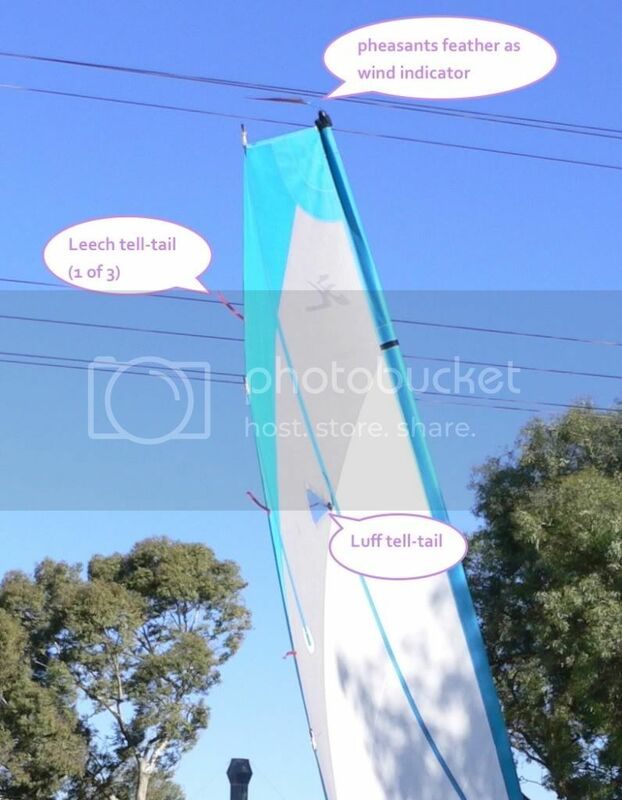 Tonystott is right about using leech (that's the back edge of the sail) & the luff tell-tails (that are already fitted to the sail) to provide an indication of good airflow over your sail. A wind indicator is only useful in providing a quick indication of where the wind is coming from. Tony is also right in that a wind indicator close to the water surface will 'see' a different wind (speed & direction) to the wind experienced at the top of the mast. The wind blowing over the surface of the water will be slowed & also bends away from the true wind direction. So lets mount the wind indicator at the mast head! Well, in that position, the wind indicator is affected by the wind vortices spilling off the top of the sail & will bend towards the apparent wind direction. If you look at modern race boats, the wind indicator is mounted not just on top of the mast, but also forward of the mast. This is in an attempt to place the wind indicator in clean airflow, with very little affect from the sails. (However, this is showing the wind direction just at one point of the sail, not the full length of the sail. Hence racing yachtsmen know how to induce twist into a sail to account for the different wind speed and direction from the bottom of the sail to the top). Since most of us are not racing, mounting the wind indicator on top of the mast is the best option to provide a rough indication of wind direction, then use the tell-tails to trim the sail. I tend to use the leech tell-tails the most. The following link shows the set-up I am using. Interesting. And here I was thinking I could trust my most accurate wind indicators - my ears.